Partied My Way Out of Singledom! | Teefa Says.. They threw not one, not two, but THREE amazing surprises for me! The first one was last month. The DGAs threw a Hen Party for three brides; Aslinda, myself and Pijot! The party was SUPER AWESOME. They kidnapped us after work, brought us to RedBox Sogo. At first i thought it was a normal get-together. 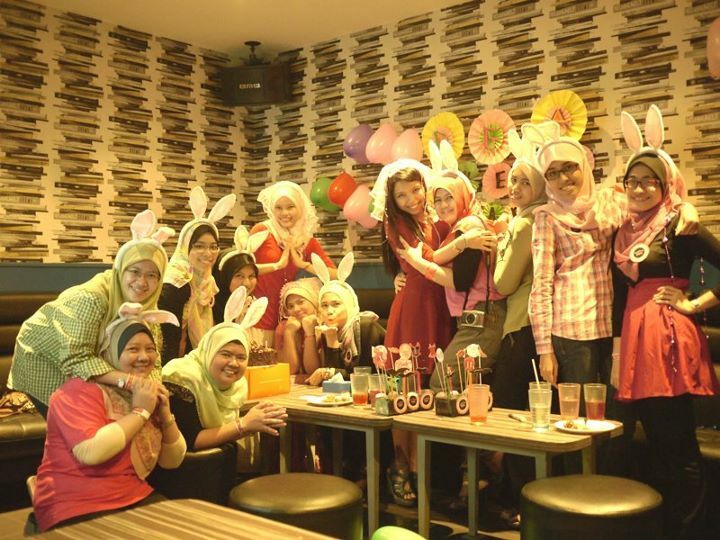 You know, karaoke, chit chat, makan-makan..
We came in to a gorgeous and glam-ly decorated room! 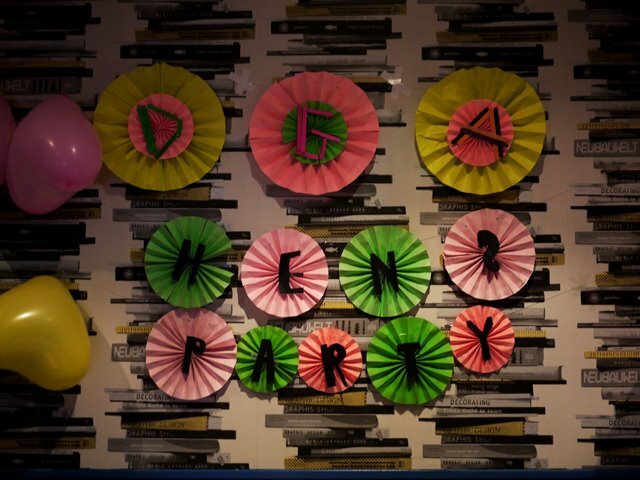 All these DIY deco was on the wall, balloons everywhere, and all fancy things.. 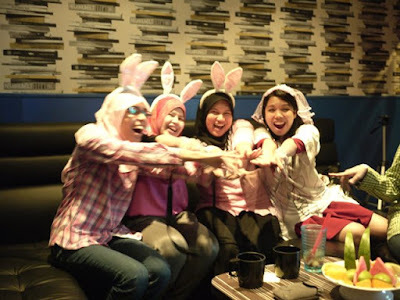 The girls were all wearing bunny ears, they are so CUTE! 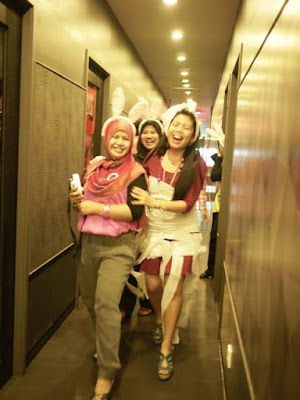 Lepas menjerit dan tergamam dan menjadi jakun, we were forced to make a speech. The hens and the brides-to-be..
From left ; Ogy, Ahya, Nadh, Kak Yulie, Chuna, Aliza, myself, Pijot, As, Pip, Anna, Shim and Fina! Nampak tak muka haku yang kebuluran itu? Then there were games! OMG, the games.. The second game was Design the Wedding Dress. 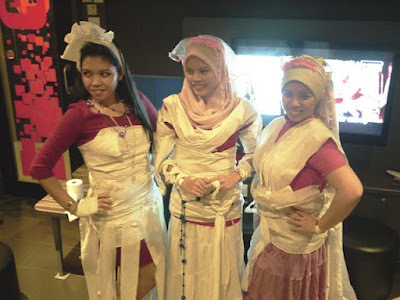 We were divided into 3 teams for the three brides. 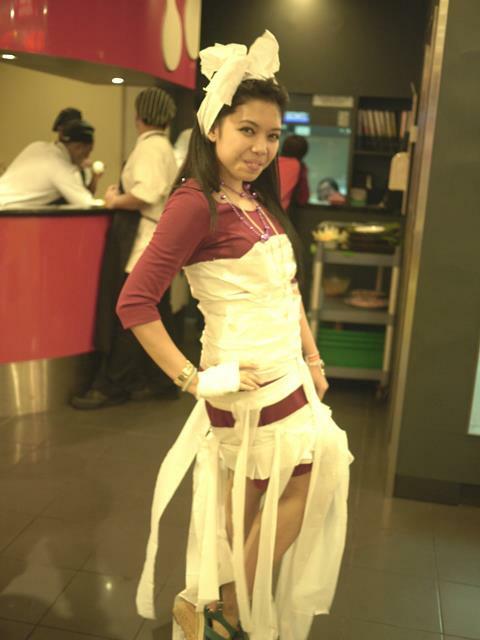 Each of the teams have to use rolls of tissue paper to make wedding dresses and dress the brides. 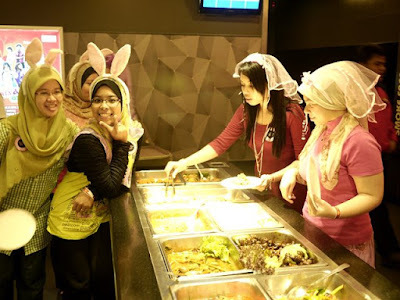 Tak cukup dengan itu, lepas berbalut dengan tisu, diorang paksa kitorang keluar bilik and catwalk along the corridor and buffet area and let the staffs of RedBox choose the winner. i looked like Lady Gaga. Sumpah malu!! Design the dress: These are my Vera Wangs! ..and the dress is ready! The brides-to-be in our bridal couture. Being pushed to the buffet area. Forced to catwalk! This one was on Monday. i sorta knew something was up when i went to Fina's cubicle. She was panicking and menggelupur, cepat-cepat tutup PC and my name was the subject of her email. And then after tapau-ing lunch, i saw Amal rushing into the office with a cake box. And pantry yang selalunya kosong tiba-tiba penuh masa aku tengah makan. Muahahaha. Despite all these, i was crazy surprised when Amal came with a cake and everybody sang a birthday song. ALOUD. In the office. It was so sweet. 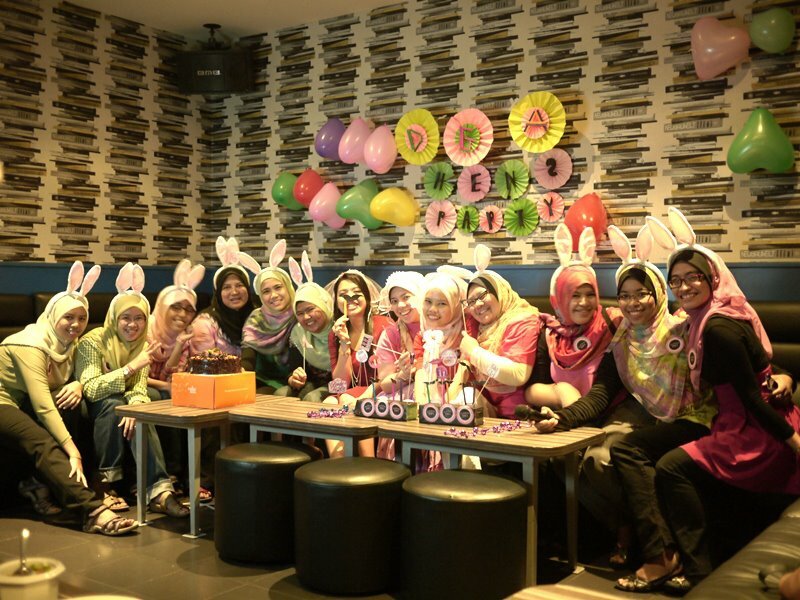 We ate cakes and laugh and they wished me happy birthday in advance and happy getting married. My colleagues are seriously the best. Amal was so animated and talkative throughout the whole session. Girlfriend's high on sugar! This one is thrown by Linda, Lina and Ahya! On Tuesday, my last working day of the year, Linda ajak cari tudung kat Arianni Wangsa Maju. As i need to find tudung for nikah as well, we both went after work. Lepas shopping, dia beriya-iya lah ajak makan Mac n' Cheese at TGIF. 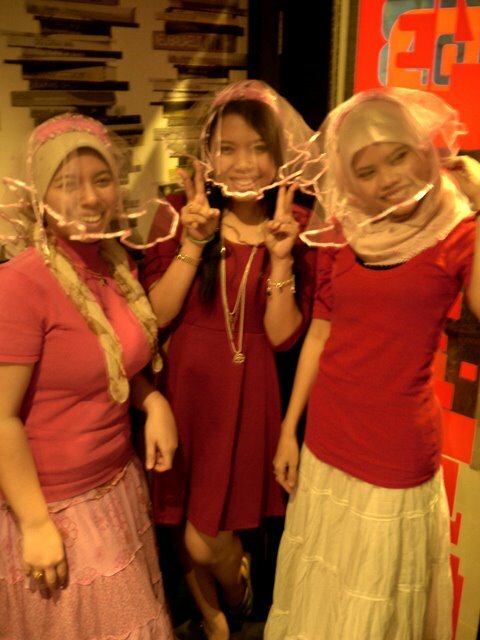 Sampai kat TGIF, she led me to a table and Lina and Ahya were already there! We ordered and had a nice talk. As i looked at these three girls, i realized that they're married. And OMG, i'm gonna join them this weekend! OMG! They gave me advice on marriage, on the whole wedding preparations.. It's just so good. Sitting there talking. i thought that was it. Then the TGIF staffs came singing the birthday song and other very long song, demanded me to stand up and give a speech and sing! Berpeluh ketiak aku, suddenly being the center of attention. Seriously, these girls are the best. InsyaAllah, i'm gonna join the club this weekend! i've had a rough past. My life was far from perfect, and like any other human beings, i have my bad moments. But i'm blessed with good friends who make me feel loved and cherished and remind me the world is still a good place. The people you choose to be in your life makes all the difference. i'm glad i have these people as friends. Kepada sayang-sayang ku, terima kasih untuk segalanya. Doakan yang terbaik untuk majlis pernikahan dan persandingan saya. You all are the best! Okay, it's 2.33am. i better go to bed now. Long day tomorrow. 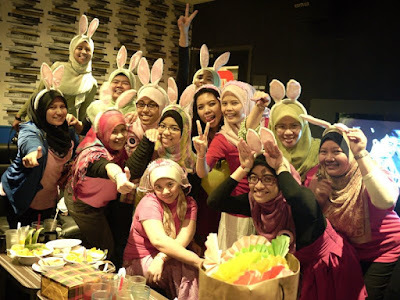 P/s: all Hen Party's photos are credit to Fina.